Fabiana imbricata has an appearance much like the upright and shrubby Erica arborea…maybe mixed with an upright form of Rosemary…providing a remarkable texture in the garden. In gardening and botany one of the first things we learn is that not everything looks as we might expect that it should! Fabiana imbricata, is a member of the Tomato Family, the Solanaceae, yet, if you don’t look too close, it looks like it might belong to the Ericaceae. At one time I was planning to take advantage of this similarity as I was attempting evoke a South African feel in part of my garden substituting this for one of the many tender South African heaths as the correct Erica species are either too tender, of borderline hardiness for my conditions or are simply difficult to come by. It was sharing an area in the garden with Restio capensis, Eucomis spp., Melianthus spp. and others to give an impression of South Africa, not a strict species for species duplication of a community. I didn’t quite pull it off….I’ve done much the same thing when substituting tropical looking temperate plants for the real thing when evoking a tropical feel. It’s a matter of manipulation…a sleight of the garden hand. This entry was posted in Botany, Climate, Evolution, Flowering, Horticulture, Mediterranean/ Maritime NW, Plant Selection, Right Plant Right Place, Site Analysis, soil drainage, Sustainable Landscapes, West Coasties and tagged Andean Plants, Fabiana imbricata on February 25, 2019 by gardenriots. The inflorescence of Fascicularia bicolor with its blue flowers. 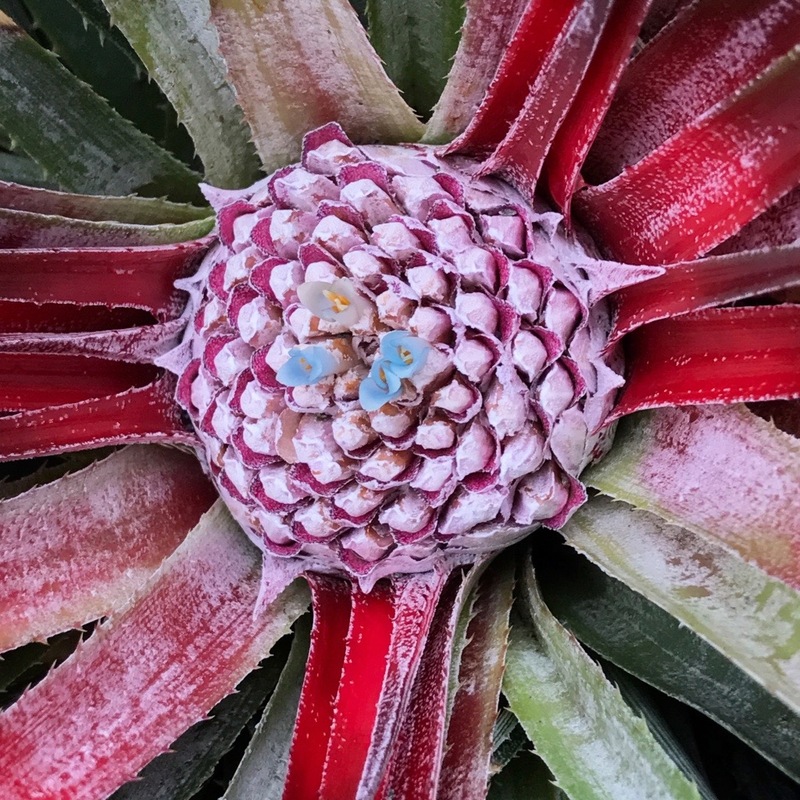 The center of the foliage on a blooming rosette, turns red when the flowers appear and then, like many Bromeliad, that rosette dies replaced be previously formed offsets. My blooming plant had multiple rosettes at the time, three of which bloomed. Taken in my garden, Sept. of ’17. This entry was posted in Botany, Horticulture, Mediterranean/ Maritime NW, My Garden, Plant Choice, Plant Selection, Practice, Right Plant Right Place, Site Analysis, soil drainage, Xeric, Zonal Denial/ Tropicalisimo and tagged Fascicularia bicolor 'Spinner's Form', Ochagavia carnea on February 16, 2019 by gardenriots. The low angle evening sun really lights the red up in this one! Impatiens omiense fronting a composition including: Vancouver hexandra, Podophyllum pleianthum, Aspidistra elatior, Dryopteris erythrosora, Hosta ‘Sum and Substance’ and Prosartes hookeri (previously Disporum hokkerig). This is the south bed on the 5th St. side of Portland’s City Hall. Hibiscus x ‘Snow in Summer’, is one of the Fleming Brothers hybrids. 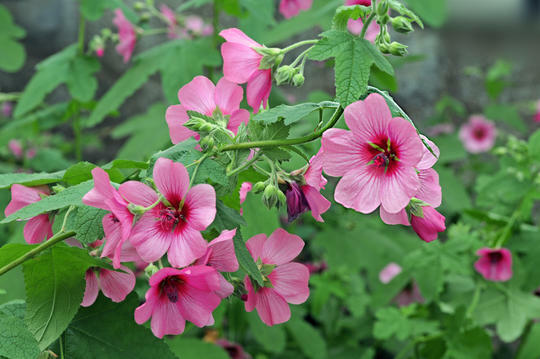 The flowers are 8″ in diameter with deeply lobed bronzed leaves. I learned this plant as Acidanthera murielae 30 years ago, though now its known as Gladiolus callianthus ‘Murielae’ has an elegant symmetrical 3-parted flower other than the missing ‘red’ blotch on the ‘upper’ tepal. Hippeastrum x johnsonii, commonly sold at florist shops as Amaryllis, looking much like a Lily, but in family Amaryllidaceae, characterized by its flowers held in umbels. Seen around it are other Monocots, Bilbergia nutans ‘Variegata’, Hakonechloa macro ‘Aureola’ and Astelia chathmatica ‘Silver Spear’. Beschorneria septentrionalis, a Mexican native and Agave relative in the Asparagaceae. This is not very often successfully pollinated here in our wet early spring. Maybe a couple of fruits ever form where there were dozens of flowers. A long shot, from beneath the ‘Pagoda’ towards the house and front gate. My front, ‘hot garden’ facing Gladstone St. Thank you Josh McCullough. Manfreda undulate ‘Chocolate Chips’, another Agave family member showing similar flower structure with the extra long filaments and 6 tepals. This plant flowers annually. Winter structure. This photo, taken in February ’16, shows evergreen substance of the Trachycarpus wagnerianus, Cordyline and the wispy Rhodocoma capensis solidly above the deciduous Molinia, at least until it is cut down. Looking north in Spring across the pushing Molinia toward the Butia x Jubea in the center with Penstemon left and Acorus on the right. 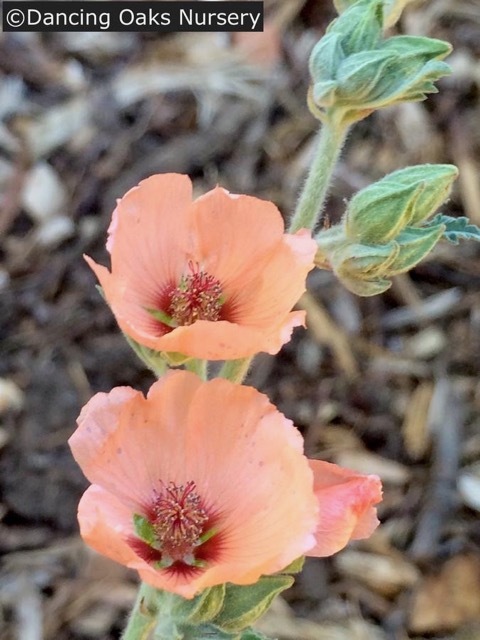 This entry was posted in Adaptive Management, Botany, Climate, Design, Evolution, Garden Design, Horticulture, Landscapes, Maintenance, My Garden, Natural Areas, Plant Communities, Plant Selection, Practice, Public Gardens, Right Plant Right Place, Sustainable Landscapes on February 9, 2019 by gardenriots. Roldana petasitis var. cristobalensis shown here looking amazing with Aeonium arboretum ‘Zwartzkop’. Its substantial leaves are some 8″ across, thick and velvety, the undersides of which are red/purple, like the stems. The color often comes through in the veins along the top surface. A very striking foliage plant. Picture this with its close relative, Pseudogynoxus chenipodiodes, the Mexican Flame Vine, formerly known as Senecio confusus! This entry was posted in Climate, Horticulture, Maintenance, Mediterranean/ Maritime NW, My Garden, Plant Choice, Plant profile, Plant Selection, Practice, Right Plant Right Place, Site Analysis, soil drainage and tagged Mexico, Plant Classification on January 8, 2019 by gardenriots. This is from the catalog of Andre Brian a nursery in France as once again this particular variety is not very common in the trade here. This entry was posted in Botany, Evolution, Flowering, Growth, Mediterranean/ Maritime NW, Plant Choice, Plant Selection, Right Plant Right Place, South African Plants and tagged InterTropical Convergence Zone, South African Growing Zones on October 26, 2018 by gardenriots.